I have to admit that when I first read the news that Westboro Baptist Church founder Fred Phelps died at 84, I was elated. He was scum and inflicted pain on others. My first instinct was to organize pickets at his funeral (there was none as it turned out) with signs reading “God Hates Bigots” or “Thank God for Dead Haters” to return the favor for his church’s disgusting activities since 1998. Few people can induce cheers from a death; Osama bin Laden is a recent example. Then after my internal celebration cooled down I asked myself why should we stoop to his level as much as it would clearly give us a sense of satisfaction and vindication? Phelps’ death does provide us with the comfort that he will never be part of a tasteless protest at funerals and other events (he hasn’t personally since 2007) though his vile, extremist daughter will be sure to carry on the tradition. He’s gone now, and hardly anyone I know shed a tear. But cheering his death and demonstrating visibly would not make us much better than him, if you think about it. The LGBT community and its allies can rejoice in the fact that we have made historic strides in the overall quest for equality; progress is seen almost every day in the U.S. if not the world. Part of this advancement can be attributed to the fact we are less likely to be viewed as some abstract, bizarre subgroup of society but everyday folks: teachers, farmers, police officers, lawyers, dentists, physicians, co-workers, neighbors, friends and family members. Acting in the same way as Fred Phelps and his obnoxious followers (mostly family members) will not help further our cause and win over those people who are slow to come around. While such release of emotion may be cathartic, it’s best to internalize it and let it be. Hating is hating, and hate is never good. But we can at least find solace in reflecting upon how Phelps had been an unwitting ally during our struggle. Sure he wants us all dead (that’s going to happen anyway) and preaches that God is a vengeful God. And his hateful language on his garish signs does not make for pleasant viewing. Look past the idiocy and think of how he helped us in ways he never imagined. When 21 year-old college student Matthew Shepard was murdered in Laramie, Wyo. in 1998, there was a chilling sadness among gays and lesbians as well as other sensible citizens. Another brutal attack on a gay man. Another killing just because of who he was. We’ve seen them before and we expected more to come. There were, and still are, too many homophobes out to destroy us. People noticed this incredible display of insensitivity and hate and paused for a minute. Who can this group be that could celebrate the vicious slaying of this waifish college student? Who can add even more trauma and heartache to his grieving family? The Westboro Baptist Church of Topeka, Kan. led by Pastor Fred Phelps managed to extend the news coverage of the Shepard murder by the hate-filled picketing. People saw this crazy band of people as extremists, and decent-minded people, regardless of their stance on homosexuality, were sympathetic towards the Shepard family. The compassion remained but it did not significantly change how people perceive gays and lesbians in America. They saw Phelps and his church as outliers and moved on. Then Phelps, et al, made the biggest mistake of all and ultimately caused a shift in people’s views towards the LGBT community. Westboro started to picket the funerals of American soldiers who were killed in the war in Iraq. They carried signs saying “Thank God for Dead Soldiers” and “God Hates Fags” among others. The families and friends of these servicemen were outraged by the taunting. As Phelps continued this practice repeatedly and winning a legal battle in the U.S. Supreme Court in 2011 over the right to free speech, more and more Americans had become furious over this brand of heinous extremism. Phelps did not stop there. They picketed hundreds of other funerals and events declaring God’s retribution for America’s acceptance of homosexuality and their gratitude for AIDS. They even celebrated the deaths of the children in the Newtown, Conn. massacre. How low is that? The country continued to despise Fred Phelps and the Westboro Baptist Church. Phelps’ hatred of gay people affected the masses whereby the enemy of my enemy was becoming their friend: gays. A few years ago, Judy Shepard, who successfully crusaded to pass Federal hate crimes legislation that was named after her son, was asked about Phelps. “Oh, we love Freddy,” she told LGBTQ Nation. “If it wasn’t for him there would be no Matthew Shepard.” She accurately pointed out that “Freddy” elevated Matthew and hate crimes in general to more prominence than would have otherwise. Phelps’ extremism caused mainstream America to despise him, and as a result, they became more empathetic to the plight of LGBT folks. As many of us should, Judy took the high road. It was an ambitious undertaking for the Iron Crow Theater Company’s founder and artistic director Steven J. Satta to create a production inspired by the works of Edgar Allan Poe and present them through a “queer lens,” as he put it. The offbeat 19th century author, poet and critic who died in Baltimore from a host of possible causes, would seem like a good fit for this Baltimore-based community theatre company whose plays generally center on issues relating to the lesbian, gay, bisexual and transgender community and are characterized by atypical, thought-provoking scripts with a good dose of sexuality immersed in the topics. Mr. Satta summoned up several playwrights who had previously helped give Iron Crow its edgy persona and strung together seven short pieces—a mixture of individual mini-plays and some aerial dance performances—in an attempt to present Poe’s works through this “queer” lens. Mr. Satta also wrote one of the pieces and, along with Ryan Clark, directed the production. As Poe’s efforts over the years met with mixed results, so, too, did The Homo Poe Show. As the transgender rights bill (Fairness for All Marylanders Act) continues to work its way through the General Assembly with hopefully positive results, the last big piece of legislation for LGBT Marylanders will be joining marriage equality in the rear-view mirror. This is not to say the work is done, however. While Equality Maryland re-tools its mission to take on matters that concern these groups, there are those who strongly believe that the most effective way to deal with anti-gay brushfires around the state is to go local. The recent physical attack of a gay couple in New York’s West Village should underscore the fact that there are too many haters out there, which cannot be masked by recent victories in marriage and transgender equality. Having local affiliates throughout the state, similar to what the NAACP does, makes patently good sense. Volunteers consisting of LGBT folks and allies in each county (or region) should form groups that could be called, for example, “Equality Allegany” or “Equality Eastern Shore” or “Equality Prince George’s” depending on the jurisdiction. With an LGBT presence at the local level, there could be more efficient ways to interact with the police on crimes or hate bias incidents directed towards LGBT folks. Local affiliates could meet with police representatives to discuss such matters and hold conversations to educate the police on LGBT concerns that cannot be accomplished at the state level. Local equality affiliates could also interact with their elected officials whether they are county executives, councilpersons, state representatives or other elected officials. Maryland is a diverse state with each jurisdiction having unique problems. Residents of these localities are familiar with these issues; perhaps they know the officials well enough to have a cup of coffee and initiate meaningful dialogue. The same could be said for the local school boards. Numerous LGBT families have children attending schools, and there are, of course, LGBT kids all over. While the state has anti-bullying measures in place, individual incidents need to be addressed at the local school board level. Who is better equipped to discuss anti-bullying policies than those people living in the same county and who may be members of the PTA or personally know members of the board? Getting the local business community behind its LGBT neighbors cannot be overemphasized. As the fracas in Arizona proved, business people saw discrimination as counter-productive and applied strong pressure on Governor Brewer to veto the preposterous discriminatory bill. The local affiliate representatives should meet with business owners—large and small—to determine how supporting LGBT rights would be mutually beneficial. I would also encourage each local group to form a speakers’ bureau consisting of at least one LGBT person, a parent of an LGBT child and another ally to foster trust and understanding. The speakers would explain that as more and more people come out as LGBT, they are your family members, friends, classmates, neighbors and co-workers. The presentations and discussions concerning LGBT issues should be directed at businesses, government entities and even religious organizations. They should push to get invited; such talks would resonate given that the presenters are neighbors and customers. Efforts at the local level have already paid dividends over the years, and there are already such “equality organizations” in place. I’ve seen firsthand the myriad accomplishments of PFLAG-Howard County, which is a model for advocacy in the state. The chapter has been successful at the county and state levels as well as in the private sector to eliminate the last vestiges of discrimination. The progress being made by both The LGBT Center and the PFLAG chapter in Frederick has been notable. They are working with the police and businesses to create a comfortable environment for a growing LGBT population in what was once a very conservative area. There are other PFLAG chapters around the state that could serve as the root organization for the equality affiliate. Chapters exist in Baltimore, Carroll, Kent and Montgomery counties, so they would be off to a fast start. There has also been some movement in organizing LGBT events in Anne Arundel. The GLCCB perhaps could serve as the principal organization in Baltimore City. They have already taken big strides through their partnering with city government on a number of issues and have maintained a good relationship with the police—key successes in an urban environment. Other affiliates, of course, would have to be established in rural counties. The tasks are more daunting in those areas given the socially conservative mindset, but that is where the work is most needed. Again, one should stress that those folks are their neighbors, customers, teachers, physicians and friends. It’s worked before; it should work again. All this localization is not designed to reduce Equality Maryland’s role in the quest for LGBT rights. On the contrary, that organization could be a significant factor in the success of this effort. I believe it should serve as the umbrella organization for the local affiliates. Since the local groups would consist of volunteers, it would not place a financial burden on Equality Maryland. They can use their database to identify potential volunteers around the state. The larger organization would provide guidance on policy matters and connect the locals to elected officials. Equality Maryland could hold an annual conference/fundraiser to discuss best practices among other subjects. To the extent Equality Maryland would have control over the local groups would be left to the affiliates to negotiate. This is a big undertaking that will take time to succeed. But going local is the right direction to take on the winding road to equality. 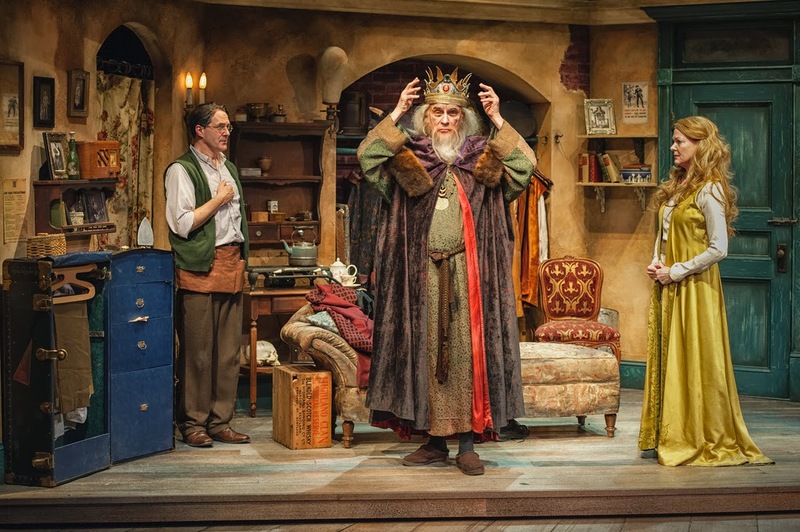 It’s not surprising that stellar actors Bruce R. Nelson and Carl Schurr would click so well in The Dresser, a well-balanced dramatic and humorous play, which is currently on stage at the Everyman Theatre. They have a long string of theatrical successes under their belts with Mr. Nelson, a local favorite, capturing a Helen Hayes Award among other honors. These Everyman resident company members formed an extraordinary duo and gave what some could rightly call an acting clinic as the two leads in Ronald Harwood’s play. The Dresser opened on London’s West End in 1980 and then on Broadway in 1981 where it ran for 200 performances. It was made into a movie in 1983. Harwood’s work was inspired by his own personal experience as a dresser to Shakespearean actor-manager Sir Donald Wolfit. But The Dresser is neither autobiographical nor biographical. It’s the story of an aging British Shakespearian actor-manager, Sir, (Schurr) whose faculties have been steadily deteriorating. Sir’s lifeline besides his wife, Her Ladyship, played by Deborah Hazlett, has been his personal dresser, Norman (Nelson), a somewhat effeminate and loyal servant to Sir, catering to his every whim. Sir is the domineering lead actor of a ragtag touring troupe of Shakespearian actors who must perform in the British provinces amidst the bombs from German aircraft during the Blitz. Never wanting to be upstaged, the one-time great actor is often tyrannical and hardly ever satisfied with the other actors’ performances. The weary Sir is preparing to don his triple crown in King Lear for the 227th time, yet he is challenged to remember which play he is performing in, much less his opening lines. Norman, his rock for 16 years—doting after Sir, boosting his confidence, adjusting his costumes and make-up, massaging him and otherwise caring for him as if he were his lover—convinces Sir to perform one more time. He not only had to struggle to persuade Sir who is sensing his own mortality, but did so over the objections of Her Ladyship and Madge, the stage manager (Megan Anderson). They want him to forego this performance and retire altogether. But Norman, whose own existence is tied to Sir’s career and becomes a powerful force when this relationship is challenged, prevails. You see, Sir needs Norman but not quite as much as Norman needs Sir in this symbiotic relationship. Sir is Norman’s life—dutifully serving the dominating Sir between nips of brandy. As bombs and air raid sirens blast outside the theater, Sir reluctantly steps on stage to deliver one of his best performances as King Lear for what was to be yet another curtain call. I will refrain from divulging what unfolds hence, but be assured the play packs a powerful dramatic conclusion. 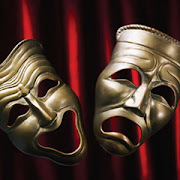 Yet, for all the dramatic moments, the play’s clever wit shines through and through. Veteran Director Derek Goldman is blessed with a highly skilled cast and crew to maximize this story of loyalty, dedication, love and the human spirit and guides the production with a steady hand. Bruce R. Nelson, as he so often does, pulls out all the stops, employing varied voice inflections, mannerisms, body language and gestures in the role of Norman. His comic timing is also spot on as he delivers one witty retort after another. Norman’s devotion to his master Sir is the foundation for his performance that included a display of jealousy during a fiery confrontation with Irene (Emily Vere Nicoll), the youngest actor in the troupe who allowed Sir to have a physical encounter with her. Carl Schurr as the once great but ailing Sir is riveting. Moving ploddingly, speaking softly until his authoritative persona needs to come through, Mr. Schurr convincingly takes on Sir’s complex character. He also delivers a number of amusing lines—even some with gallows humor about the war and sickness—bringing the audience to laughter. Together, Mr. Nelson and Mr. Schurr form an impressive acting duo whereby each action, gesture and spoken word is blended in perfect harmony. Deborah Hazlett’s performance as Her Ladyship is also proficient in allowing the audience to believe that Norman is more able to reach Sir than she could at this stage of their relationship. The other actors Megan Anderson as Madge, Emily Vere Nicoll as Irene, Will Love as Geoffrey Thornton, James Whalen as Mr. Oxenby and the remainder of the ensemble, James Bunzli, Will Cooke, Benjamin Lovell and Frank Tesoro Vince provided the leads with strong support. James Fouchard was meticulous in designing the set, with its stage lighting fixtures and high brick walls to depict the backstage of a 1942 theater in the English provinces. Most of the scenes take place in Sir’s dressing room, which is brought out on stage via a turntable to the audience’s left side. Unfortunately, that positioning put the Everyman audience seated on the right side of the theater at a slight disadvantage. The center of the stage is used for the actors to walk to and from the dressing room’s door and later during the King Lear play within the play. Nonetheless, the dressing room set was so detailed and complete one would think that it was Sir’s flat. In a way it is surprising that the room contained such accoutrements as bookshelves, a stove, photographs, and an assortment of knick-knacks along with the standard desk and sofa given that this is a touring company—not one that took up a more long-term residence. One indication that this room is a temporary setting: the open trunk at the side of the sofa. Regardless, the set is splendidly designed and serves as a great backdrop to where most of the dialogue takes place. Sound designer Chad Marsh also excels. The booming sounds from bombs and air raid sirens made the theater vibrate lending stark reality to what is transpiring outside. When cast member were using thunder sheets, drums and other devices to depict a storm scene in King Lear, they had to beat these instruments even harder to drown out the sounds of bombs—a chilling effect. The creative team as a whole backs up a solid cast. With The Dresser, one is sure to enjoy a potent story with sufficient opportunities to chuckle and to witness a pair of sterling actors working brilliantly at their craft. 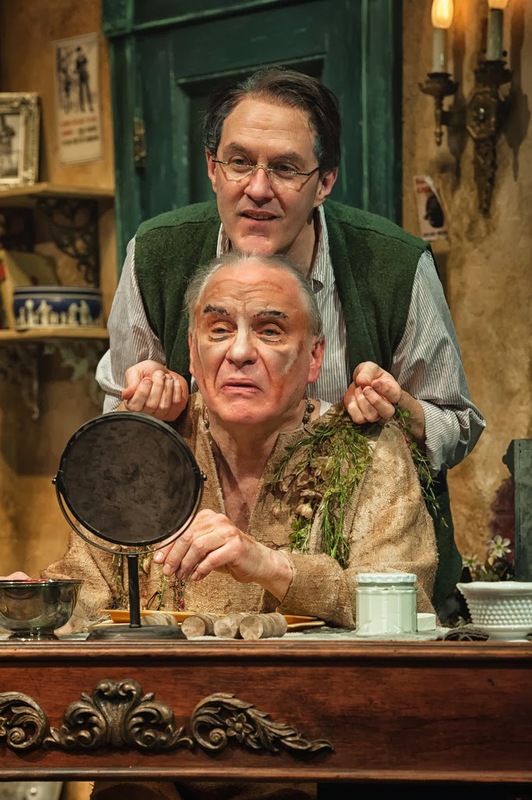 The Dresser runs through March 23 at the Everyman Theatre, 315 E. Fayette St., Baltimore 21201. Tickets may be purchased by calling 410-752-2208 or online.